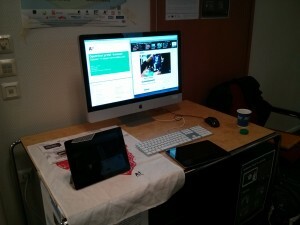 ITK, Finland’s largest educational technology conference, was organized for the 24th time. Our team, LeGroup, was present with LeTech, showing off our prototypes and demos under the banner of Aalto Learning Innovations. Square1 functional prototype at ITK 2014. 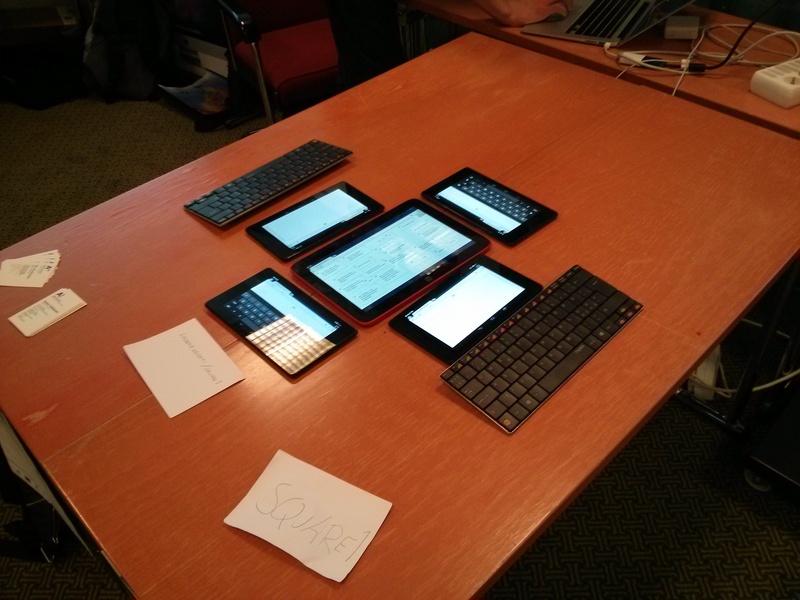 Square1 is a concept of team work using digital single-use devices. Imagine a group of students writing, drawing, taking pictures, collecting everything into a single place, and reorganizing, discussing, and filtering them into something useful, be it an essay, a poster, a presentation or something else. Imagine the devices not being between people, but rather just tools, like pens and paper, useful but not the point. Imagine people really being present in the moment, discussing, arguing, working together. This is what we hope Square1 could become. The individual devices could be built using Arduino or Raspberry Pi as a core, a physical keyboard (for the writing devices, since serious writing on a virtual keyboard is just silly), or a touch screen (for the drawing devices). You could order the parts to a school and have the students assemble the devices, building a frame with modern manufacturing tools (3D printer, laser cutter, plastic vacuum mold, etc.). Table for testing Ach So! and a screen for showing example videos to a larger audience at ITK2014. Ach So! is a video annotation tool. It’s currently an Android app that is free to download. In a few weeks, video sharing and uploading will be complete. Currently you can record videos, add annotations to them, and view the annotated videos. Ach So! has been developed initially to support on-the-job learning in a construction yard setting, but can be used in various other scenarios as well. And download Ach So! to your Android device from the Play store. TeamUp and ReFlex are prototypes for supporting team and individual reflection. Like all our prototypes, they are open source and free for anyone to use. TeamUp helps created heterogenous, motivation-driven small teams and facilitates group reflection. ReFlex works as a learning diary for individual students, with time capsules to set learning goals, and the possibility to share reflections with a teacher to help in student guidance sessions. Edukata is a collaborative design guide for teachers. With an experienced facilitator, teams of teachers can redesign their learning practices, with empirically proven results. Learning Activities designed by our team have been piloted in over 2500 classrooms across Europe. This entry was posted in Conferences, iTEC, LEAD, Learning Layers and tagged 2014, ach so!, edukata, itk, letech, reflex, teamup by Tarmo Toikkanen. Bookmark the permalink.